Conspiracy theorists have had a field day with this assumption, and it cannot be denied. From his 1961 speech, to his issuance of Executive Order 11110, it seems that President Kennedy saw something very profound, and wanted to convey it to all Americans. He tried to explain his insight with tangible effort. Unfortunately his assassination thwarted his efforts. 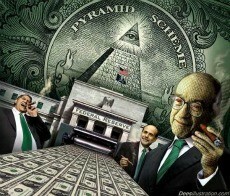 It is suggested that President Kennedy might have been assassinated by The Federal Reserve, or the conglomerate banking systems that dominate both Europe and America. Executive Order 11110 was the attempt to bring back United States notes backed by silver, returning to the Treasury Department the Constitutional power to issue debt-free currency. It is suggested that this would have usurped the Federal Reserve, but not all are in agreement. Some very intellectual writers propose the accusations to be fallacious. To see the relevance of these claims one must understand Austrian economics, as taught in our higher learning institutions . Ludwig von Mises' (1881-1973) "A treatise on economics Human Action" is the primer for this understanding. The link above will bring the reader to the first paragraph of the introduction to the scholar's edition where it is explained both graphically and collectively. "On June 4, 1963, a little known attempt was made to strip the Federal Reserve Bank of it's power to loan money to the government at interest. On that day President John F. Kennedy signed Executive Order No. 11110 that returned to the U.S. government the power to issue currency, without going through the Federal Reserve. Mr. Kennedy's order gave the Treasury the power "to issue silver certificates against any silver bullion, silver, or standard silver dollars in the Treasury." This meant that for every ounce of silver in the U.S. Treasury's vault, the government could introduce new money into circulation. In all, Kennedy brought nearly $4.3 billion in U.S. notes into circulation. The ramifications of this bill are enormous. Read the rest on Strawberry Fields here. It is powerful. Connect the dots on the Examiner article here. It is powerful. A nation that is afraid to let it's people judge the truth and falsehood in an open market is a nation that is afraid of it's people. Was Kennedy's Executive Order 11110 Revoked? E.O. 11110 was not reversed by President Lyndon B. Johnson and the section added to E.O. 10289 remained on the books until President Ronald Reagan issued Executive Order 12608 on September 9, 1987 as part of a general clean-up of executive orders. E.O. 12608 specifically revoked the section added by E.O. 11110 which effectively revoked the entire Order. By this time, however, the remaining legislative authority behind E.O. 11110 had been repealed by Congress when Pub.L. 97–258 was passed in 1982.